Homelessness breaks up families. These authors examined the effects of separations of children from parents and of partners from each other in a clinical trial of three housing and service interventions at 12 sites across the country. Families in homeless shelters with at least one child under 16 years old were offered one of three interventions: permanent housing subsidies that reduced rent to 30% of families’ income; temporary housing subsidies with some services directed at housing and employment; and temporary housing in supervised facilities with extensive psychosocial services. Twenty months later, permanent housing subsidies almost halved rates of child separation, and more than halved rates of foster care placements. The other interventions had no meaningful effect on separations. This unique large-scale experiment shows that permanent housing subsidies reduce not only homelessness but also the break-up of families that frequently follows from homelessness. Although cancer mortality has declined by 20.1% across the United States since 1980, a few cancers are on the rise and clustered in particular counties. Ali H. Mokdad and colleagues gathered death records from the National Center for Health Statistics and the Census Bureau to measure exactly how and where cancer mortality changed between 1980 and 2014. The map on the left shows 2014 county-level mortality for all cancers per 100,000 people, with red areas representing counties with the most cancer-related deaths. The highest mortality is clustered in the Midwest, the South, some counties in the Dakotas, and Alaska. 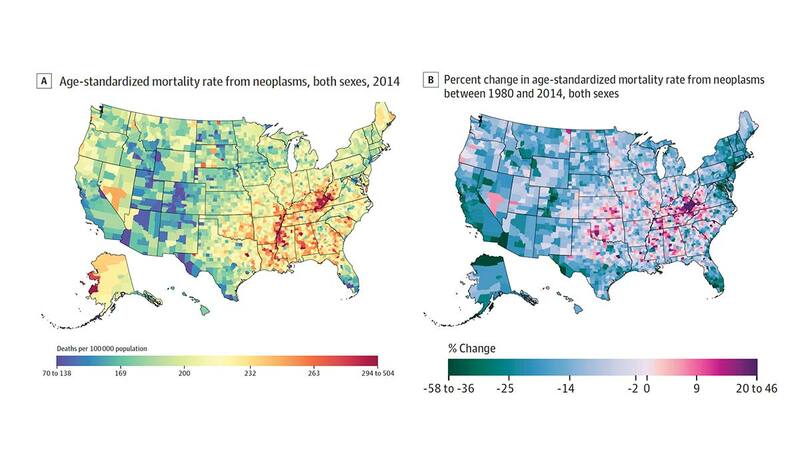 The map on the right displays changes in mortality between 1980 and 2014. Counties experiencing decreases in mortality are represented in blue and green and those experiencing increases are pink and red. Liver cancer mortality has grown by 87.6% with the largest increases in California, New Mexico, West Texas, and Alaska. Mortality for all other cancers has stayed the same or declined. HEADER IMAGE: Petras Gagilas, *** (detail) CC BY-SA 2.0.